Two weeks before “Us” hits theaters, Jordan Peele’s follow-up to “Get Out” screened for the first time Friday night at SXSW in Austin, Texas. And judging by the early reactions from critics, it appears Peele isn’t suffering from any sophomore slump. In her review for TheWrap, Yolanda Machado praised the performances of Lupita Nyong’o and Shahadi Wright Joseph, saying each brought something completely different to their dual roles the mother Adelaide Wilson and her daughter Zora, and then as their creepy doppelgänger personas. Machado also said that Peele — who wrote, directed and produced the film — cemented himself as the best horror filmmaker in the business. “Nyong’o gives a master class in acting in dual roles and is almost unrecognizable as her doppelgänger persona. (Which is as much plot as will be revealed here.) Not only does she take on an entirely different voice, but her posture, movements and facial expressions suggest a different individual entirely. At times, I had to remind myself that this was the same woman; that’s just how good she is,” Machado writes. Most of the other critics largely agreed with Machado’s take, even if some thought “Us” may have been a little too ambitious for its own good. But the early word is that Nyong’o is the clear star of the film. Check out some more reviews below. “Peele’s overarching social commentary is clear, but he also said that he wants every individual to tailor their interpretation to their own experience. As with ‘Get Out,’ this film certainly has plenty to do with the black experience in this country. One of the biggest, most uneasy laughs of the night went to Nyong’o when, in full monster mode, she responded to the question “who are you?” by croaking, defiantly, “we’re Americans.” But ‘Us’ is never just one thing. It’s a masterpiece of doubling, layering, and tethering. 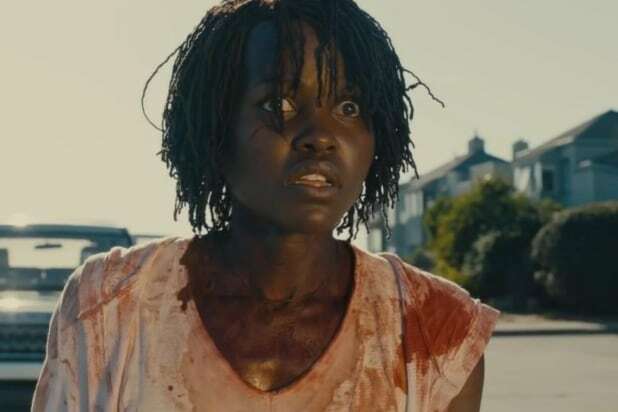 It’s also a movie packed to the brim with horrifying iconography–the red jumpsuits, vacant-eyed bunnies, and always those slicing shears–some of which has obvious meaning, while Peele is disinclined to break down the rest the way he did with Get Out. “Us” stars Nyong’o and fellow “Black Panther” star Winston Duke as a married couple who take a trip to a Northern California summer beach home along with their children, and meet another couple portrayed by Elisabeth Moss and comedian Tim Heidecker. Nyong’o’s character slowly becomes paranoid about her children’s safety, and as she becomes more concerned, they witness four figures in red suits holding hands at the end of their driveway. Those figures aren’t just anyone, but exact replicas of themselves. “Us” opens in theaters on March 22.